eBookNewser has put together lists of 5 eBook Publishers to Watch and 5 eBook Authors to Watch, and today put out 5 Children’s Book App Publishing Experts to Watch. Michel Kripalani (Oceanhouse Media) and Kate Wilson (Nosy Crow) were no surprise but I’m going to have to do some research on the other three. The list was only posted today, so there are no comments yet, but I’ll be checking back to see if anyone else has other big names to add. 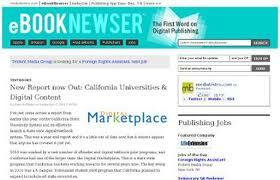 Posted on March 19, 2012, in Apps and tagged ebookNewser. Bookmark the permalink. Leave a comment.